A visit to Chalice Well in Glastonbury (pictured) and a couple of discussions on a Facebook group made me decide to blog about what not to do if you visit a sacred spring or holy well. 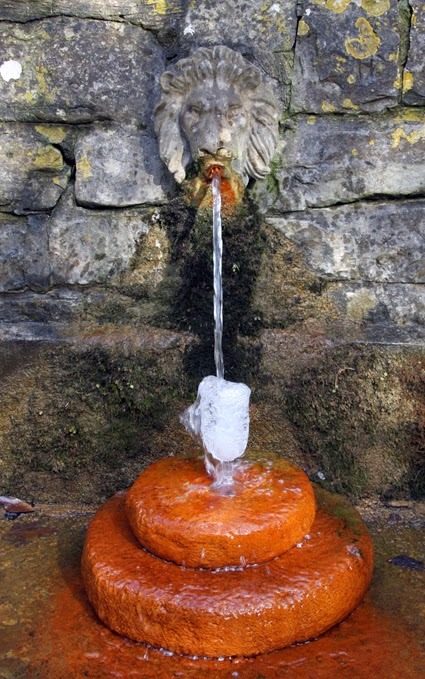 Although the water at Chalice Well is drinkable, many other springs come with a health warning. While it might be tempting to take a cool drink from what looks like a source of pure water, even the most sacred of springs might not be safe to imbibe. Taking just a little sip is risking the consequences of nasties from parasites to pollution. Boiling the water or using a filter bottle will get rid of bugs and bacteria, but won't necessarily deal with nasty chemicals that could have contaminated it. Always check before drinking from springs, wells or streams. When in doubt, don't drink the water. This is a subject that gets hotly debated on some forums. The issue stems from a tradition, particularly in parts of Ireland and Scotland, of tying clooties to trees at some holy wells. Clooties are strips of cloth that would be dipped in the well water and then tied to a nearby tree along with some sort of prayer or wish. I must admit I personally quite like seeing decorated trees in places where it is allowed, but there are problems with the practice. The main concern is that modern clooties are often made from non-biodegradable material, such as polyester ribbons or even plastic. These will stay on the tree pretty much forever rather than rotting away. They can restrict the growth of the tree and too many could eventually kill it. So, if you want to tie anything to a tree, make sure it is natural fibre that will quickly disintegrate in the wind and rain. The other issue is that visitors are not only tying clooties at places where it is a genuine old tradition. Most sacred springs and wells do not have a historical connection with clooties, so those who honour the old folk customs in those places get upset when they see beauty spots clogged up with bits of rag. Some will spend a long time cleaning up the site, only to find it just as bad then next time they go there. When in doubt, don't do it. Fires leave an unsightly mess behind, which spoil the site for those to come. They can cause damage to historic monuments if they are lit too close and can get out of control. Even the small flame of a candle could spark a forest fire. Always check if naked flames are allowed before lighting one. At some places they are, of course. 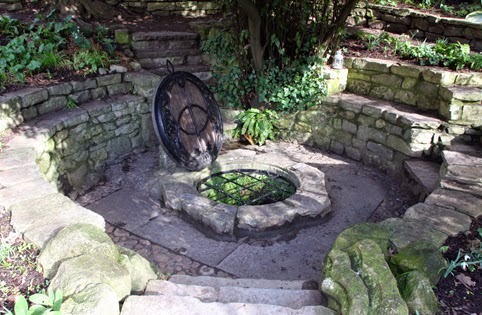 For example, you can buy tealights at Chalice Well Gardens to light at the well head to meditate with or to leave as an offering. Volunteers tidy up the tealight holders at the end of the day. But again, when in doubt, don't. Apart from candles and clooties, visitors sometimes think it is a good idea to leave other offerings - from statues, crystals or home and garden ornaments to flowers or food. Although biodegradable items are better than non-biodegradable ones, anything left behind can just look like litter to those who come later. If there is a specific place where offerings are allowed to be left, that's fine, but there usually isn't. Take away with you everything you bring unless specifically requested to do otherwise by the site owners. It is traditional to throw coins into some wishing wells. Often these coins are collected for charity and, of course, there's nothing wrong with doing this if it is asked for. But do check. Photography is banned at some sacred sites, including the White Spring in Glastonbury, which is just over the road from Chalice Well. Many pagan groups will also ban photography when ceremonies or meditations are taking place. The reason for this is the belief that photography infringes on the privacy of the people who are there and can also affect the sanctity of the sacred space itself. Please be respectful. Ask permission before taking pictures of people and if there is a sign forbidding photography, then don't take photographs at all. It is usually OK to take a small bottle of water away with you if you visit a sacred spring, but don't take things like pebbles or soil. If everyone took a pebble or pot of earth away it could undermine the site. And certainly don't go chipping bits off any monuments! Avoid picking wild flowers too, unless you have permission of the site's owners. If you are visiting any sacred site, check what is and what isn't allowed. If the spring has an official website, that should have details. When in doubt, leave the site just as you found it.